Transcend has announced a new series of SDHC memory cards. The series is called Transcend Ultimate Class 10 SDHC memory cards and has improved transfer speeds with transfer speeds of 20MB/s. The memory cards has capacity up to 16GB and should be able to run high end HD movies without any lag. 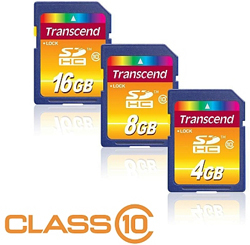 Transcend Ultimate Class 10 SDHC memory cards will be available with capacities from 4GB to 16GB. Transcend Information, Inc. (Transcend), a worldwide leader in storage and multimedia products, is proud to announce the launch of its Ultimate Class 10 SDHC™ cards. Part of Transcend’s “Ultimate” line of powerful high-speed memory cards, the new Class 10 SDHC ™cards easily outperform current Class 6 cards, with enhanced transfer speeds of 20MB/s and massive storage capacity of up to 16GB. As high-tech gadgets become increasingly advanced with ever-improving video and audio quality, memory card write speed plays an important role in taking high-megapixel pictures and shooting high-definition videos. Featuring the top-of-the-line Class 10 speed rating introduced by the SD™ Card Association this year as part of its new SD™ 3.0 specification, Transcend’s new Ultimate series SDHC™ cards provide blazing fast performance tailored specifically for high-speed consecutive shooting as well as smooth HD video recording. Compared to Class 2 cards that only guarantee write speeds of 2MB/s, or Class 6 versions that start at 6MB/s, the new Class 10 SDHC™ cards boast 16MB/s write and 20MB/s read speeds that help process data quickly and prevent lag when recording 1920×1080 Full HD videos at 60fps. Transcend Ultimate Class 10 SDHC™ cards offer impressive data transfer rates, giving users the ability to unlock the full capabilities of their DSLR cameras. To meet the requirements of high-megapixel DSLRs that can fill memory cards quickly, Transcend Ultimate SDHC™ cards are available in high-capacity sizes ranging from 4GB to 16GB. The 16GB SDHC™ card can store up to 6552 pictures (based on 5 megapixel JPEG compression format), over 88 hours of standard quality video (MPEG-4 video at 384 Kbps), or 240 minutes of HD video (AVCHD at 9 Mbps), providing photography enthusiasts with sufficient space for their high-resolution digital masterpieces. Currently offered in 4GB, 8GB to 16GB versions, Transcend’s new Ultimate series Class 10 SDHC™ cards are highly recommended for entry to mid-level digital camera or camcorder users.